A vegetable garden has taken root and new policy and wellness leaders are in place—promising indicators that change has come to Washington and that improving the nation’s health is a priority. From healthcare reform to the trials and errors of fixing an ailing economy, Washington’s plate is full of puzzles in need of political problem solvers. But even though diabetes and heart disease hurdles may not grab headlines as frequently as job woes, there’s reason to believe the Obama administration has nutrition on its mind, too. While specifics are still coming down the pike, the president and Congress are taking notice of the food and nutrition world. “President Obama is the first president we know of who has spoken about the importance of the dietitian in preventive health strategies. He’s talked about nutrition in numerous events as he has described health policies and programs. That bodes well for issues that dietitians care about. On Capitol Hill, too, many members are interested in nutrition and willing to invest time to develop stronger policies and programs,” says Tracy Wilczek, MS, RD, LD, chair of the American Dietetic Association’s (ADA) Legislative and Public Policy Committee. “Obama has on more than one occasion mentioned the importance of nutrition—from the role of dietitians in healthcare and in the context of managing diabetes to the eating habits of his own family. That is a significant step forward in my opinion,” says Mary Lee Watts, MPH, RD, director of science and public affairs at the American Society for Nutrition. It’s hard to say what concrete conclusions will come; however, many nutrition professionals are hopeful that there’s good nutrition news on the horizon. First Lady Michelle Obama made headlines in March by planting a vegetable garden on the White House’s South Lawn. And although recent reports that the garden tested positive for elevated lead levels (93 ppm, whereas the Environmental Protection Agency cites dangerous lead levels above 400 ppm) stirred up some concern, there’s no doubt the self-proclaimed mom-in-chief is making healthy eating habits one of her talking points nationwide. While many RDs agree that one garden won’t fix the United States’ obesity epidemic in one fell swoop, Susan Burke March, MS, RD, LD/N, CDE, who practices in Flagler Beach, Fla., says it symbolizes a wholesome hope for the future of Americans’ health. “Encouraging and supporting kids and families to eat more fruits and vegetables is enlightened. Although one garden won’t change the nutrition profile for many, it’s a symbolic gesture that gives hope for educated leadership and stronger financial incentives for growers of more than corn and sugar,” she says. Watts has high hopes that the garden will inspire Americans to get growing on their own and become more connected to the foods they eat. “What I especially like is Michelle’s outreach to schoolchildren in the District of Columbia, who may obtain a greater appreciation for nutrition and healthy eating habits by having the opportunity to participate in the White House gardening activities,” she says. Cathy Kapica, PhD, RD, LD, CFCS, FACN, vice president and director of global health and wellness for Ketchum Communications, notes that the garden may have a greater impact on everyday Americans than on the actual first family. “The garden will likely have little impact on the Obama family, since they have been and will continue to be served higher priced and higher quality foods. What it will do is draw attention to the importance of children and adults understanding where food comes from,” she says. Still, the garden has its shortcomings. “I’d like to see the Obamas try that garden in their hometown of Chicago in the winter, however. This would bring a much-needed discussion of the realities of agriculture and a year-round food supply that is currently not being discussed,” Kapica points out. According to an ADA report, “Studies show children perform better in school when they have adequate nutrient intake.” As such, the Child Nutrition Act holds utmost importance for the health of our nation’s children. Congress is set to renew this act by early next year, and the ADA is hoping for some big changes in what foods U.S. schools are serving students. “The act reauthorizes the [National] School Lunch and Breakfast programs, as well as the WIC program and others, such as the Child and Adults Care Food Program. Every five years, when reauthorization takes place, it’s a really hot topic in the nutrition community as advocates are looking to improve these programs,” explains Watts. “There’s been a lot of discussion around what they call ‘foods of minimal nutritional value,’ foods that don’t really contribute a lot to the daily nutritional requirements for children, and the issue of ‘competitive foods,’” such as those served in a la carte lines or vending machines that compete with what school programs offer. Competitive foods are often higher in sugar and fat (think sodas and candy bars) than those provided in school lunch or breakfast programs because any foods not part of the traditional school programs aren’t regulated by the USDA. However, many nutrition professionals are hoping this will change with the upcoming reauthorization. While Weber explains that this recommendation is certainly not new (the ADA pushed for it at the last Child Nutrition Act reauthorization), a new environment gives her higher expectations this time around. “[The ADA] tried to get it in the last reauthorization unsuccessfully, and we have been working on it ever since, so it’s not a new issue. You never want to say anything is a given with Congress, but the environment has changed a lot since the last reauthorization,” she says. The last fight pitted nutrition and public health groups against not only the food and beverage industry but also many in the education community who were worried about a loss of revenue with the increased regulation. In addition to an acknowledgement by many that rising obesity rates need to be addressed, a bigger help was the fact that some schools had voluntarily implemented vending machine and other changes and either survived or thrived. “There have been some schools who were early adopters that changed what they were selling in their vending machines, their school stores, their a la carte, and many of them didn’t lose money and some of them made just as much or made more [money]. Or they found that more students were participating in the school meal program, so they were getting more money through that program. So that helped alleviate a lot of the concerns in the education community,” Weber says. Also in this reauthorization, Washington RDs are pushing for more funding for nutrition education and research, as well as the setting of nationwide standards for school nutrition directors at the district level. “We’d like there to be some standards at the national level making sure that there are qualified professionals in the schools to be able to manage what’s becoming more complex programs, as well as a more complex student population. There are more kids now with allergies or with chronic health conditions, and we really think there should be somebody at the district level who can help manage that. We think that person should be a registered dietitian; a dietetic technician, registered; or a school nutrition specialist,” says Weber. Watts has her sights set on the possibility for a greater emphasis on nutrition research. “My hope is that, with the greater attention being paid to nutrition by the Obama administration and what seems to me to be a renewed sense of its importance, greater investment will be made in nutrition research—not only at USDA but also at the National Institutes of Health and at programs at the Centers for Disease Control and Prevention. Ongoing and increased federal support for nutrition research is critical if we are to enact the best and most effective policies and if we are to understand if the current policies and programs are working,” she says. It’s no secret that healthcare reform is one of Obama’s big-ticket items for 2009. While specifics of nutrition-related provisions are still being tossed from the House to the Senate and back again, the ADA is staying focused on its highest of hopes for what health reform could mean for Americans’ health. “The ADA’s strategic plan calls on ADA to work in ways to improve the health of Americans. That is a bold statement. It should be a primary objective for health reform to actually improve the health of Americans. That will save dollars and save lives, increase productivity, and have a positive effect on the nation and its people. We believe that improving health begins with nutrition strategies,” says Wilczek. Interestingly enough, language regarding nationwide restaurant labeling may also be included in health reform legislation. “They’ve included language requiring nutrition disclosure on restaurant menus in healthcare reform legislation in [at least] one of the bills. There have been a number of states and local areas that have already implemented some kind of menu labeling, New York City being one of them. Members of the Senate were able to reach a compromise with health organizations and the National Restaurant Association to require this on a national basis and basically preempt local and state requirements,” says Watts. If passed, any restaurant that has 20 or more outlets could be required to include calorie information on the menu or menu board and other items, such as sodium, fat, and cholesterol figures, elsewhere in the restaurant. No matter what language makes it to the legislation finish line, Liz Marr, RD, is just happy prevention is on the lips of Washington legislators. “As an RD, I’m pleased to see healthcare reform moving forward; it’s long past due. I’m also glad the Obama administration is focused on prevention and demonstrates individual action,” she says. Early in the year, the president made it clear that he believes the U.S. food safety system to be a “hazard to public health” and in need of some serious reworking. Since then, he has formed an interagency Food Safety Working Group that recently released recommendations on how to improve the safety of the nation’s food, including a better tracking system to pinpoint origins of food outbreaks. At the writing of this article, the House of Representatives was also doing its part to make food safer for Americans, passing legislation that would require the FDA to conduct inspections every six to 12 months at “high-risk” food processing plants and allow the creation of an FDA-directed system that would better trace a food product’s path in the occurrence of future outbreaks. If you’re contemplating how you can help the nutrition cause along, “it’s simple,” according to March, who says the ADA makes it easy to be effective and to be heard. She directs those interested to the Grassroots Manager icon on the ADA’s Web site, where you can click on the Take Action tab. There, you’ll find live links to different topics containing descriptions of various bills and opportunities. “Other ideas to get involved include sending your legislator a fax or calling them directly” about issues that most interest you, she says. Joining professional organizations such as the ADA and the American Society for Nutrition and participating in their public policy/advocacy activities is another way to make the nutrition policy change you’d like to see in the industry. 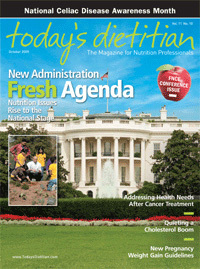 What are dietitians’ thoughts on how the Obama administration and Congress have treated nutrition issues thus far? “I feel sanguine. In his [recent] news conference, Mr. Obama talked not only about insurance reform but also personal responsibility and noted his support of this paradigm shift by including his advocacy of professional guidance from ‘your nutritionist.’ I would have liked for the president to say ‘your registered dietitian,’ but the message is clear,” says March, author of Making Weight Control Second Nature. — Juliann Schaeffer is an editorial assistant at Today’s Dietitian.